I was about to embark on a horticultural adventure! Look how excited I was. Plant nerd and proud of it! Topiary couch here we go! 1994 by my first college roomie and me, before we moved into the dorms at Iowa State University. It was the coolest couch on the 4th floor, and I loved every fiber of it! It wasn’t the most comfortable piece of furniture, but it looked awesome! Everyone on our floor loved it. In fact, somebody once tried to steal it from us and we had to go back and reclaim what was rightfully ours! As old as it was, I could never part with it, because I loved it! Unfortunately, my cat had other ideas. He thought this lovely piece would make a nice litter box. I tried to clean it, but was never able to get the cat aroma out of it. 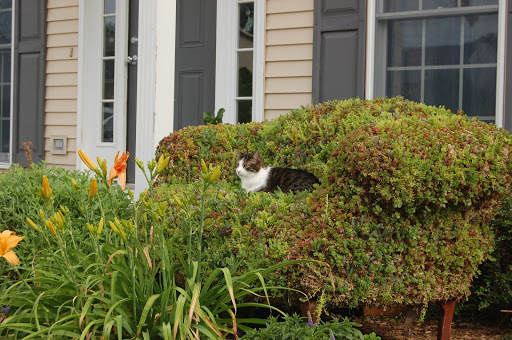 The time had come to make a decision, either get rid of the beloved love seat, or do the one big thing that had been on my horticultural bucket list for the past 10 years..Turn the love seat into a live Topiary sculpture. I was up to the challenge. After all, how hard could it be? I had a 16 month old baby, and a first grader. I needed something to do in between naps, diaper changes, school pick ups and drop offs anyway right? So why not? I wasn’t new to topiary. I studied horticulture in college, and had the opportunity to work as an intern at Longwood Gardens in Pennsylvania, one of the most amazing public gardens in the United States. I spent 6 months there, and learned quite a bit about how to prune, and maintain topiary. After graduating with a B.S. in Horticulture from Iowa State University, I spent 2 years working with topiary as a horticulturist at Chicago Botanic Garden. I guess what I am trying to say, is that this whole, living couch thing, didn’t just happen on a whim. I had plenty of time to think about it, and practice on other sculptures, learning what might or might not work for this project! So, yep, I did it. And I still can’t believe it. Each photo is captioned with info on how I went through the process of creating a living sculpture for my garden from this old victorian love seat. In all, it took me about a month before it was ready to set out in the garden, and about 2 or more months for the cuttings to get established and start to green up and grow. Lots of pinning, sewing, pinching, and watering went into this neighborhood landmark. The couch from 1994 and the lady who covered it with plants. The giant upholstery needle that started it all. The wildlife netting sewn onto the couch by the lady. The compressed bale of New Zealand Long Fibered Sphagnum Peat Moss that the plants would root into. Soaking the peat moss in warm water, getting ready to cover a couch! The lady using a staple gun to attach the wildlife netting to the couch. The start of shaping. The netting is attached. Time to start stuffing with the peat moss! Shaping with the moss, and sewing it in place, one section at a time with heavy fishing line for thread. First layer of moss is sewn in place! Sedum cuttings trimmed from the garden, and ready to place under the netting and on top of the peat moss. First layer of cuttings placed! Laid horizontally, the cuttings will root themselves in a few weeks. Underside view of the soon to be topiary. The seat was the easiest part! I still sewed it in place to try to keep the tufted look of the original love seat. Tucking in the sides to maintain authentic shape of the love seat. A bucket of cuttings onto the seat and all tucked in. Note, how the cuttings are laying horizonatally. Sedum cuttings will naturally curve on their own to make contact with their substrate and generate new roots. Time to flip over the love seat. This made doing the back much easier, so as not to have to fight with falling peat moss when trying to sew the tufts of moss in place. Getting ready for a lot of tedious work! Each area where there was a button, was sewn in to recreate the quilted look of the back of the love seat. The back was tough, but the vertical sides were even harder! Sometimes, I wonder how I ever pulled this off! Lots of fishing line and lots of pulling tight, to hold up all of that heavy sphagnum moss! When the moss gets wet, it can hold a huge amount of water, so I really needed to reinforce the sides to stand up to the weight. I think I was probably wishing I had about 100 hands at this point. Closing in on the end of the sewing! Hooray!!! With the help of our neighbors, we hoisted the piece right out to the front garden, where it became a neighborhood landmark. This is what it looked like after all of the cuttings were placed. The cuttings take a few months to really take off. After a month or two, they start to grow. The scene a few months after installation in our garden. A sea of sedums, all taking off! With a lot of tlc, frequent waterings until they start to root, and regular fertilizing every few weeks, it looked like this! My living love seat has survived 6 harsh Iowa winters and is still alive to this day! Wanna know how to give your couch a hair cut? This has been my weapon of choice for tackling the job of trimming my topiary couch for the last 6 years. It was a Mothers Day gift to me from my husband, Tim, also a horticulturist, and my two boys. They know me so well! It sure beat having to pinch all of those sedum tips by hand! Although, my youngest son sure enjoyed pinching the tips and seeing how high he could throw them at the window behind the couch! Ahhhh…..memories. If you want to be able to attach the wildlife netting to the couch, you need a heavy duty needle. Luckily, I found one of my mom’s old upholstery needles from an old sewing kit. It was essential in shaping the netting around the couch to duplicate the victorian look. Had I not done this, the couch would have looked much more like a big blob! Fishing line is your friend when it comes to topiary. It is see through, so it is invisible, which makes your project look nicer, especially in the beginning stages when all your little cuttings are just getting started. The only thing you have to worry about, if it’s a long term project meant to last for multiple seasons, is that any fishing line exposed to direct sunlight, can break down over time and lose strength. So this is what I mean by wildlife netting. It comes in a seven feet by 100 feet long roll. It was the perfect width for my love seat. Easy to cut into pieces for smaller projects too! If you click the link, you will see there are many brands at different prices…I just chose this one because it had the best picture to explain what it looks like. So to the right, you see a giant straw colored blobby bale?This is long fibered sphagnum moss. It is the key ingredient for most topiary projects. I used a bale this size, 22 lbs, to cover my couch with a 4 inch thick layer of it. It has the ability to soak up a hunormous amount of water, which makes it ideal for getting plant cuttings established…like a few pounds of sedum spread out over a couch! This glob of silver shiny stuff is a glob of what we topiary folks call greening pins. I used them to place cuttings in the vertical sections of the couch. I could only sew in so much of the netting with the fishing line, so this is what I use in between! I would lay the sedum cutting horizontally underneath the wildlife netting, and then carefully pin it in place with one of these. Using the pins helped the cutting to maintain contact with the moss…essential for getting roots started. Once the topiary got to growing, I was able to lay cuttings over the top of the netting, and use these pins to hold them in place too. The living love seat has survived 6 harsh Iowa winters. It’s about to go through it’s 7th, but there is a bit of a problem. Some how, during the last month of dry weather, I think that some honey bees have decided to set up shop in the back side of the love seat! I found out the hard way one afternoon, as I was giving the couch a shower. A swarm of about 100 bees started coming from behind the couch! I quickly ran away, and stopped watering. Even though I was super careful, I still ended up getting stung by one that snuck in on my clothing. Ouch!!!!! Consider it a good ride, and call it the end of an era? Try to harvest some honey? I wonder if we would have some tasty honey as we have so many varieties of flowers in our garden. Spray the poor bees and keep the couch? Spray the bees and send the couch to the landfill? Just wait till a frost freezes out the bees and then decide? Holy cow, there is a honey thief among us! Something broke into the back side of my topiary couch to get to the honey! There is now a 10 inch diameter hole in the back side, and the remnants of a bee hive! Yikes! I feel sorry for whatever creature stirred up that bees’ nest. I am slightly jealous though, because I bet that honey was deeeeeeevine! This is the back side of my topiary couch, you can still see the velvet under all the sphagnum moss, and it still looks the same as it did 20 years ago. The moss must have preserved it. As for the honey, I think it’s gone. Sedum Couch: This is a real couch that I stuffed and covered with sedum. It survived a zone 4 winter, and is still looking good for the 2nd season! My cat, Uno, was being a good sport by posing for me. Now that’s what I call a topiary.